Developing from the humanscapes , these mythological creatures are much more human in appearance. They all have elemental hairstyles. 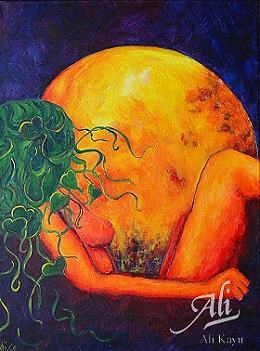 A priestess contemplating Diana, sits with the moon looming in the background, her hair moving in the wind. Diana the Huntress, part 1 of a diptych the second part of which is Apollo her brother. Yes, she's the painting I completed after the tree nymph. 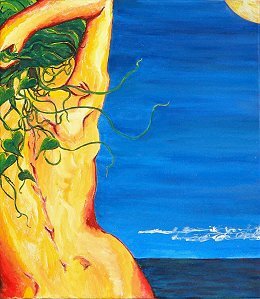 A nymph stands up to her hips in water, her morning glory hair blowing in the breeze. No, she is not a Dryad, who are the Oak nymphs.